VIKINGS, VAMPIRES, AND VANGELS, OH, MY! The hypnotic voice on the self-motivation tape was supposed to help Ruby Jordan solve her problems, not create new ones. Instead, she was lulled from a failing marriage to an era of hard-bodied warriors and fair maidens. But the world ten centuries in the past didn’t prove to be all mead and mirth. Ruby had to deal with a Norseman who had her husband’s face, habits, and desire to avoid Ruby. 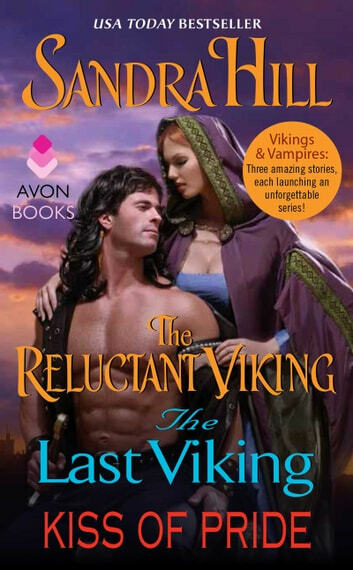 Determined not to lose the same man twice, Ruby planned a bold seduction that would conquer the reluctant Viking—and make him an eager captive of her love. He wore nothing but a leather tunic, spoke in an ancient tongue . . . and he was standing in Professor Meredith Foster's living room. The medieval historian told herself he was part of a practical joke, but with his wide gold belt, callused hands, and the rabbit roasting in her fireplace, the brawny stranger seemed so . . . authentic. Some men are too bad to be true . . .
Is he really a Viking with a vampire's bite? An angel with the body of a thunder god? A lone wolf with love on his mind? Alexandra Kelly, his prey, thinks Vikar Sigurdsson is either flat-out crazy or he's trying to maneuver her into his bed—which is hardly where a professional reporter should conduct an interview, tempting as that prospect might be. And some men are too good to be true . . .
Until Vikar does something a teensy bit unexpected, and Alex begins to wonder whether her mystery man could really be everything he says he is: a Viking Vampire Angel on a thousand-year-long mission with his pack of sinful brothers—and a man who's finally found the woman of his dreams. By then, Vikar is already wrapping his chiseled arms around Alex's body . . . and sinking his wicked fangs right into her neck. If this is sin, why does it feel so good?